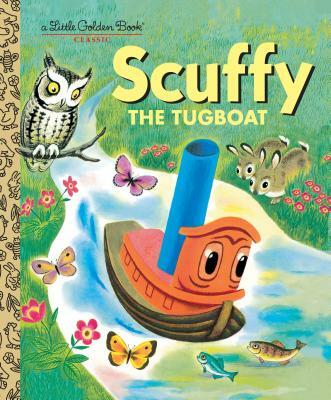 One of the most beloved children's stories ever—the classic Little Golden Book tale of Scuffy, an adventurous little tugboat. Meant for "bigger things," Scuffy the Tugboat leaves the man with the polka-dot tie and his little boy and sets off to explore the world. But on his daring adventure down the river, Scuffy realizes that home is where he'd rather be, sailing in his bathtub. Generations of parents and children have cherished this classic Little Golden Book, originally published in 1946. GERTRUDE CRAMPTON (1909-1996) wrote the beloved classic Little Golden Books Tootle (published in 1945) and Scuffy the Tugboat (published in 1946), both of which have never been out of print. Crampton was born in New York in 1909, and studied at the University of Michigan, Ann Arbor. She died in 1996. TIBOR GERGELY (1900-1978) brought to life two of the most popular Little Golden Book characters, beloved by generations: Scuffy the Tugboat and Tootle. Born in Budapest, Hungary, he received his formal art schooling in Vienna at age 20. Gergely designed stage sets and marionettes and worked as an illustrator and cartoonist for central European newspapers. In 1939, Gergely immigrated to the United States, settling in New York. His long association with Golden Books began in 1942—the year of its launch—and continued as long as he lived. In 1955, Gergely received a Caldecott Honor for Wheel on the Chimney, written by Margaret Wise Brown, author of Goodnight Moon. He illustrated more than seventy Golden Books, including The Great Big Fire Engine Book, The Taxi That Hurried, Daddies, The Merry Shipwreck, Seven Little Postmen, The Happy Man and His Dump Truck, Animal Orchestra, and Animal Gym.